The fire of Barbra Streisand. The magnetism of Kris Kristofferson. The reckless world of big-time rock 'n' roll. Download A Star Is Born in Digital HD from the iTunes store. A Star Is Born images are © Warner Bros.. All Rights Reserved. 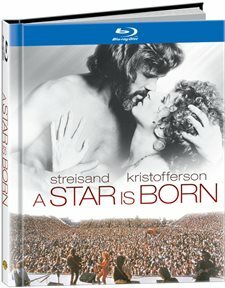 One of the best rock musicals of the 70s A Star is Born comes to Blu-ray for the first time. Nicely presented inside a book featuring many of the scenes from the film, the special disc should bring back a lot of memories from an era when rock was king. The film features Kris Kristofferson and Barbra Streisand giving performances that burn up the screen vocally and with a hot romance. The movie tells the story of John Howard (Kris Kristofferson) a rock n' roll superstar in a downward spiral and fighting to stay alive for his fans. With drugs and wild tours dragging him down, he's just about to give up when he meets Esther Hoffman (Barbra Streisand) a talented singer with a ‘kicking' voice that can excite huge crowds. Its love at first sight and sound of her voice for John and he decides to take out a new lease on life by making Esther a star. When the new star starts to shine brighter than his, his world starts to crumble. If you are a fan of Kristofferson and Streisand than I'm preaching to the choir, but if you haven't had the opportunity to see what these two talented singer/actors can dish out, then it will be an extra special treat for you. I remember the film very well when it was on the big screen and now with a nice transfer onto Blu-ray in high definition it's a chance to relive it at home. I like what has been done with the video adjusting the size to 16x9 to fit the full television screen. Upping the contrast for excellent detail the film becomes crisp and clean with no visible fading, blur or distortion. The Blu-ray's sharpness shows it all from the crowded concerts to the interior shots where a lot of the drama takes place. Since music commands a huge role in the success of the movie, the sound quality becomes important to the transfer from film to Blu-ray disc. The tech department does a fine job of providing the digital quality with 5.1 DTS-HD Master Audio. The songs are vibrant and combined with the high definition picture you get a nice feel of the concerts and crowd. If your system allows for surround sound, with a little imagination I found myself reliving some of the rock fests I attended back in the day. High notes, midrange and bass all come into play in the film and not a note turns sour. The movie has a few very good special features all enjoyable, interesting and classically historic. "Commentary by Barbra Streisand" adds a lot to the disc. Here she talks about the filming of the movie, some personal incidents and how it all came together. Her knowledge of filmmaking expressed here doesn't surprise me as she shows her talent for directing with The Prince of Tides some 15 years later. "Wardrobe Tests" Streisand takes the floor again talking about the costumes. In the film some of her outfits were actually from her own closet. "Deleted Scenes/Alternate Takes with Optional Commentary by Barbra Streisand"- I recommend you turn on Streisand's commentary here because she lends most of the reasons for pulling scenes, etc. from the 12 snippets. "40-Page-Blu-ray Book" is quite unique in that most of the photos are spread out among the film, filmmakers, and cast. It also acts as the case for the Blu-ray disc. You may know a lot about Barbra Streisand's career as she has been an icon from her early career starting 1963 as a singer appearing on the Bob Hope Comedy Special television show at the age of 21. Her legacy started five years later when she acted in and performed the songs for the film Funny Girl which she followed up with Hello, Dolly both musical successes and excellent career starters. From 1969 to 2012 she made 19 films with her latest Guilt Trip. Some of most memorable moments came with her comedy in such films as For Pete's Sake, Nuts and Meet the Fockers. She's an Oscar winner for Best Actress in Funny Girl and she also took home another statue for writing the song "Evergreen" for the movie A Star Is Born. Kristofferson has had a good run from 1971 to 2013 as an actor appearing in over 100 titles including Millennium, Paper Hearts, the Blade series and the recent Dolphin Tale. His music can be heard on 79 movie and television soundtracks and was nominated for an Oscar for the score from Songwriter. He took home a Golden Globe award for Best Actor in A Star Is Born and was nominated for his acting in the same film for an Oscar.